We carry a wide selection of Inogen G3 accessories. Please call us at 877.774.9271 if you have any questions. We carry a wide array of accessories for the Inogen One G3! The accessories are designed to make life easier and more active. We have carry bags and a backpack that will make transporting the G3 painless. We also have accessories that will extend the life of the G3. They include G3 extra batteries; 8 cell and 16 cell, G3 external chargers and power cords. We offer the all Inogen G3 accessories and supplies and always have inventory that ships same day. 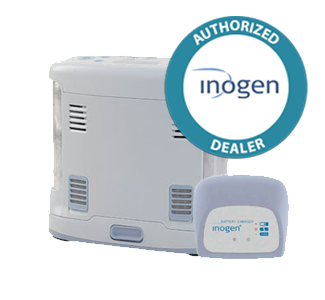 The Inogen One G3 is one of the best portable oxygen concentrators for those who want to live a very active lifestyle. It has a slim design and only weighs 4.9 lbs with the 8 cell battery. There are two battery size options - the 8 and 16 cell batteries – giving those who need to use their concentrator for longer hours a better option than having to recharge more often. The settings run from 1 to 4 in pulse dose oxygen. This powerful, little concentrator comes with the accessories you'll need to start using it. You might later decide that you need extra batteries, a backpack to carry it in, or the external battery charger! We have all of those things right here, and can get them to you ASAP. Extra batteries are extremely important if you have any model of portable oxygen concentrator. You never know when you might need them, or if you are traveling, you will definitely need some already-charged batteries to pop into your G3. You can get a G3 16 cell battery, or another 8 cell battery, as well as the external battery charger, which makes it possible for you to charge extra ones much quicker. You can usually recharge your external batteries around 300 times before they start to decline. After that, they will only charge up to around 80%, and that's when you know you need to replace them. If you bought a second set, you can get by with using these for a while, but you should always have your back up set. Your G3 batteries can charge and the unit can run at the same time, while plugged into the cigarette lighter outlet in your vehicle (DC power). It's important to make sure the car's engine is running, before you plug the DC power supply into the car's outlet, or you will drain the car's battery. Charging and running in the car at the same time will save you a lot of time. It's a smart idea to have a different DC adapter for each vehicle you travel in on a regular basis. This will prevent wear and tear on the adapters, as well as prevent you from forgetting this important accessory when you get into your other vehicle to go somewhere. The Inogen One G3 is so small and light that you won't need a mobile cart. You do have the option of getting the backpack to carry it in. Both the carry case and the G3 backpack will help protect it from bumps, as well as the elements or any accidents that might happen. Get yourself a set of batteries and designate them your “vacation set” if you plan on doing a lot of traveling. This will help you preserve these batteries and make them last longer for when you take long trips. Your “home set” will always be there for you, as well. Just making a day trip to see friends? Keep a few extra, already-charged batteries in your car so you'll always have them. When you use them, be sure to charge them up again and put them back. You'll need to change the Inogen One G3 gross particle filter once a year. You can purchase in packs of two, so you won't need to buy any more for a couple years.